A CAPTCHA is a type of challenge-response test used in computing as an attempt to ensure that the response is generated by a person. The process usually involves one computer (a server) asking a user to complete a simple test which the computer is able to generate and grade.The term "CAPTCHA" was coined in 2000 by Luis von Ahn, Manuel Blum, Nicholas J. Hopper, and John Langford (all of Carnegie Mellon University). It is an acronym based on the word "capture" and standing for "Completely Automated Public Turing test to tell Computers and Humans Apart". In this post I am going to tell you guys how to crack weak captcha s using python and Tesseract OCR engine.Few days back I was playing around with an web application.The application was using a captcha as an anti automation technique when taking users feedback. First let me give you guys a brief idea about how the captcha was working in that web application. From this you can easily understand that the “captcha.php” file returns an image file. If we try access the url http://www.site.com/captcha.php each and every time it generates an image with a new random digit. Suppose after opening the feedback form you got few text fields and a captcha.Suppose at a certain time the captcha loaded with a number for ex. "4567". So if you use that code "4567" the form will be submitted successfully. Now the most interesting thing was if you copy the captcha image url (which is http://www.site.com/captcha.php in this case) and open the image in new tab of same browser ,the cpatcha will load with a different number as I have told you earlier. Suppose you have got "9090" this time. Now if you try to submit the feedback form with the number that’s was loaded earlier with the feedback form( which was "4567" )the application will not accept that form. If you enter “9090” then the application will accept that form. For more clear idea I have created this simple Fig. 3)Craft an http POST request with all required parameter and the decoded captcha code, and POST it. Now what is happening here?? 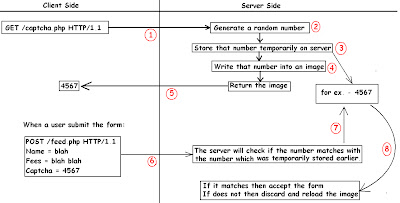 When you are requesting the image file, the server will do steps 1 to 5 as shown in figure. Now when we are posting the http request, the server will match the received captcha code with the value that was temporarily stored. 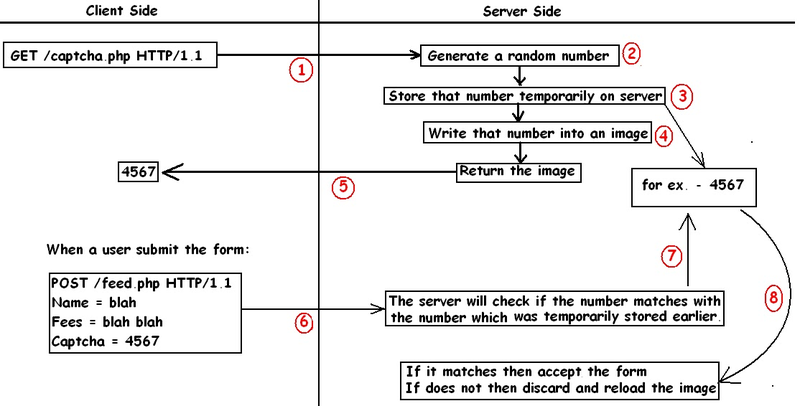 Now the code will definitely match and server will accept the form. Now I have used this Python Script to automated this entire process. Here I am only posting code of OCR engine. If your are a python lover like me you can use "httplib" python module to do the rest part.This script is not idependent. pytesser python module is requred to run this script.PyTesser is an Optical Character Recognition module for Python. It takes as input an image or image file and outputs a string. PyTesser uses the Tesseract OCR engine, converting images to an accepted format and calling the Tesseract executable as an external script. The script works in this way. 1)First the script will download the captcha image using python module "urlretrive"
After that It will try to clean backgroug noises. 2)When this is done the script will make the image beigger to better understading. 3)At last it will feed that processed image to OCR engine. Here is another python script which is very useful while testing captchas.You can add these line to your script if the taget captcha image is too small.This python script can help you to change resolution of any image. Thanks for reading.I hope It was helpful.Feel free to share and drop comments. In computers, debugging is the process of locating and fixing or bypassing bugs (errors) in computer program code or the engineering of a hardware device.Debugging is the Fundamentals part of Exploit Development .When you are writing an exploit you are going to need to be able to execute the code in your target application in a variety of different ways, to give you the appropriate amount of control to monitor the code and memory closely when needed. You may want to run normally at one point, to go step by step through each individual instruction at another, and sometimes to have it run quickly to a particular point allowing you to take control once that point is reached. Luckily, this is all possible via the use of a debugger by using breakpoints as well as the various methods for stepping through code.In this article will try to describe most common features of GDB.First we will take a simple C program.Compile it, And after that break it with GDB. 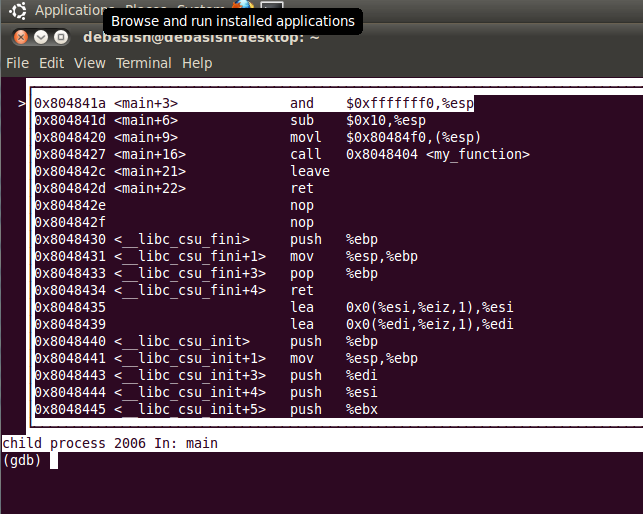 GDB, the GNU Project debugger, allows you to see what is going on `inside' another program while it executes -- or what another program was doing at the moment it crashed. After some basic debugging we will use some portable Linux based tools to gather more information about a Linux Executable. 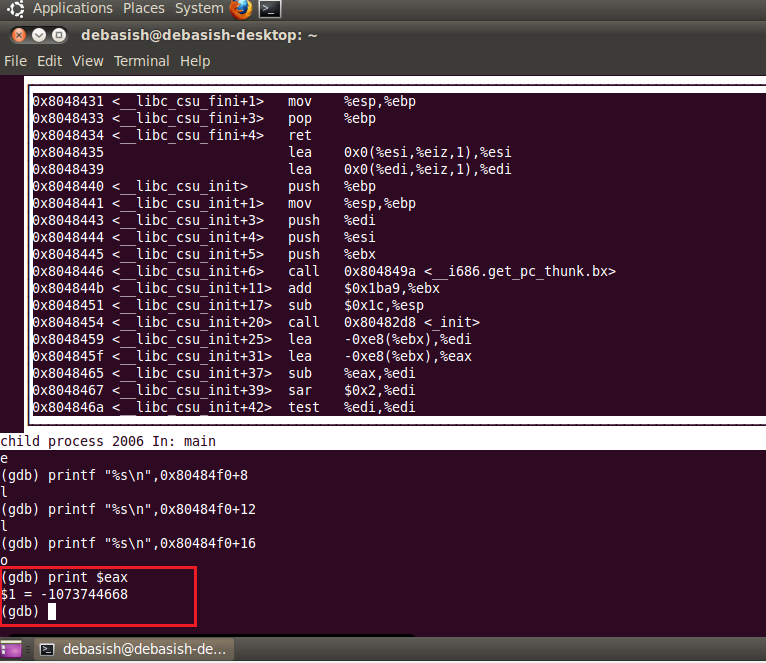 So here we will debug this simple C program using gdb. First of all we will use gcc compiler to compile the C prog. So we have successfully compiled our C program and its working fine. 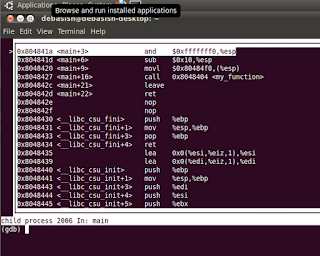 Now we will debug this program with gdb debugger.We will use following commands. 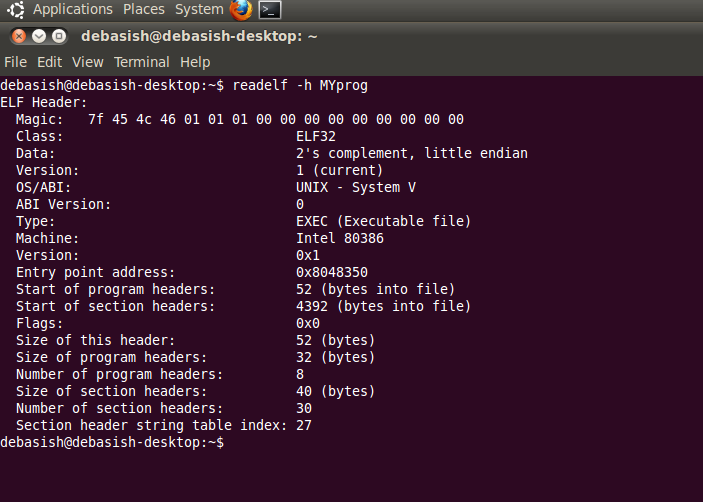 Reading symbols from /home/debasish/MYprog...(no debugging symbols found)...done. So now gdb will load the program and at entry point it will pause the execution. Then we will use the command "start" to start the debugging process. We can see that is showing the break point is at 0x0804841a. Now we will use the command "layout asm" to see the assembly code in a proper order. Now you should get a window like this. Now in extreme left side the address shown, is the virtual address. The ">" sign indicates that the Break point is at 0x804841a.Which is our main function. This will substructure the 10 from the ESP. Next move instruction takes the value $0x80484f0 and put it in stack.We all know that Stack grows downward in memory! Now more interestingly if you look at the 2nd line of the code you can see $0x80484f0 is the starting address of the string Hello World. To validate that we can use this command. Now it will return the first character of our string that is a H.
One thing to note that GDB cant print wide character to it will just return "H". Now its obvious that adding 4 with this we will get our next character. And adding more bytes will give our full string "Hello World"
Now step by step execution of assembly instructions is very important while trying to understand flow of any program.We can do this using "si" command. "si" stands for "step into". 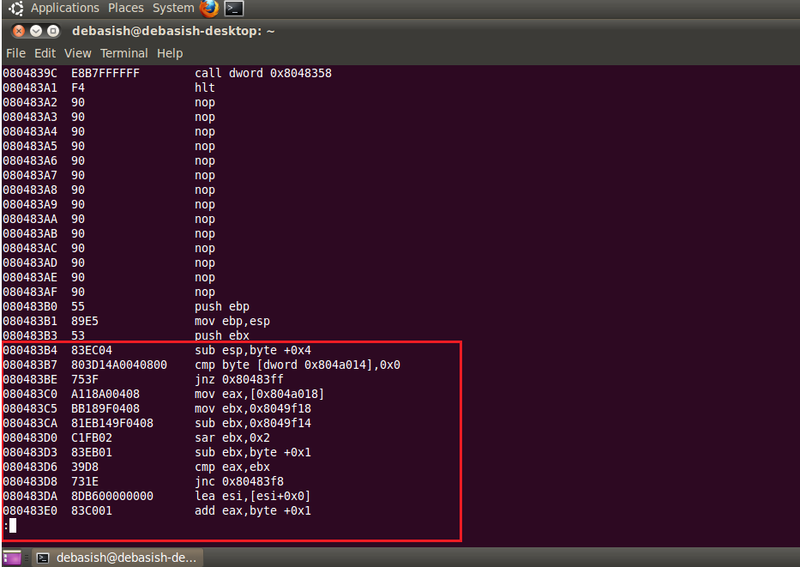 When si is entered gdb will execute the next instruction just after break point. 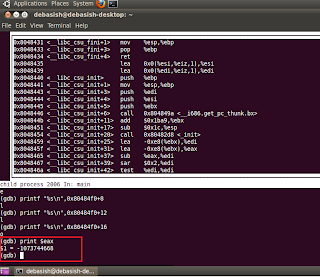 Cont is another gdb command which can be used to run rest of the instructions at a time. Now when playing with debugger its very important that at the same time you look at the status of the stack and registers.In interactive disassembler like Immunity,Olly debug in windows you can just easily monitor them.But for a command line debugger it will be not that easy. At any point of time when you wanna check any register content you can do this just by using the command "print"
There are more in gdb. Hopefully I will write another article on it. 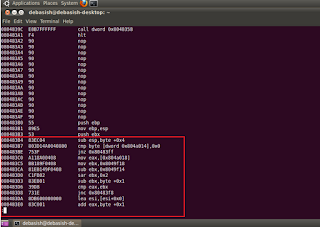 One other tool that can be very useful for reverse engineering Linux based prog is "hexdump"
Use the hexdump tool with -C option will dump raw hex dump of executable.Which we usually get at the lower left corner in case of Immunity debugger or Ollydebug. Now if you wanna see first 16 bytes of the executable then you can use the option -n.
This will print the header part of executable. The command "file" also can be used to retrieve some useful information about any executable. This command will give the header information of this executable in detail.This will also retrieve the program entry pint. ndisasm is another cool tool comes with Ubuntu using that you can actually disassemble the binary. the option -e will escape fist 320 bytes.Which is nothing but the header part. But if you notice you can see this is not the code we have just seen in gdb. The reason is it the entry point.The code present here is used by the application for setting up the stack. Now after this following instructions when stack is already configured ,if we jump at the address 0x8048358 we can have the assembly code we just saw in gdb. Look at the screen shot [red marked]. After the NOP sleds we can see the codes we have just seen in gdb. It was the most fundamental of debugging linux application.I hope it was helpful.I will try to write more on gdb later on. 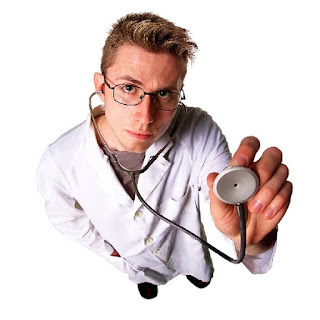 Dr. Watson is an application debugger included with the Microsoft Windows operating system. It may be named drwatson.exe, drwtsn32.exe or dwwin.exe, depending on the version of Windows.Dr. Watson for Windows is a program error debugger that gathers information about your computer when an error (or user-mode fault) occurs with a program.Dr. Watson creates a text file that is Drwtsn32.log. On Windows NT and above the memory is divided into two parts, the user mode and the kernel mode. What differentiates user mode from kernel mode is the privilege level. The primary memory restriction placed on user-mode programs is that they cannot access any of the kernel-mode memory. 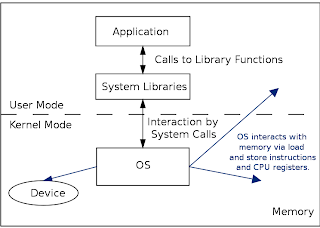 Although a user-mode program can try to directly communicate with a hardware device, the system prevents it from doing so. You probably have seen the result of such an attempt, the point where Dr. Watson pops up. A kernel-mode component must determine whether an exception is the result of a legal or an illegal operation; when a kernel-mode component catches an illegal exception, it notifies the Dr. Watson user-mode application. 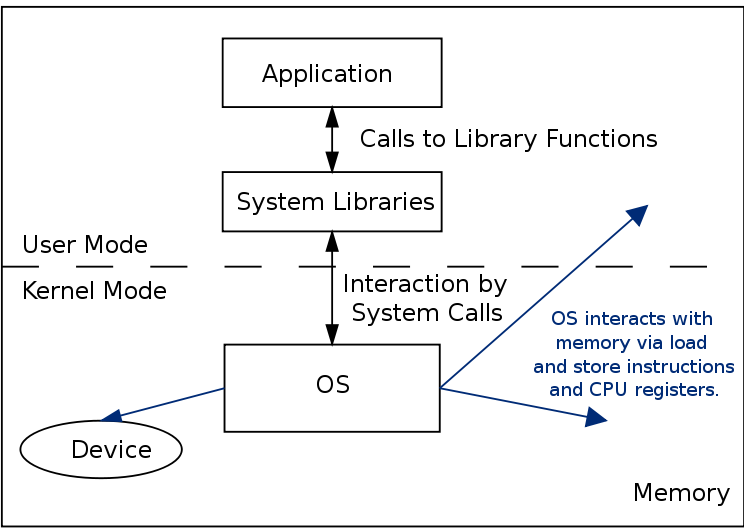 kernel-mode device drivers and subsystems can almost do anything they want. This lack of protection also emphasize the need to take care when loading a third-party device driver, because once in kernel mode the software has complete access to all OS data. Type drwtsn32, and then click OK. When Stop errors occur, the system automatically dumps the contents of its RAM to the paging file, and then writes the pagefile contents to the systemdrive root by default. 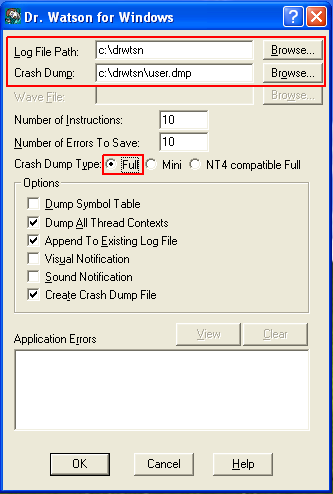 Analyzing the dump file can help provide more information about the root cause of a problem. Small memory dump files contain the least information, but consume the least disk space, 64 kilobytes (KB). Small memory dump files are sometimes referred to as "mini" dump files. A complete memory dump file contains the entire contents of physical memory when the Stop error occurred. The file size is equal to the amount of physical memory installed plus 1 MB. named systemroot\Memory.dmp and creates a small memory dump file in the systemroot\Minidump folder. Go to Start > Run > type drwtsn32 -i and press Enter. Check that the program has been successfully registered as the default debugger and click OK.
Go to Start > Run > type drwtsn32 and press Enter to start Dr.Watson. Select a folder for saving log file in the Log File Path field, e.g. С:\drwtsn. Select the same folder in the Crash Dump field. Select Full in the Crash Dump Type section. Check that the full dump file has been successfully generated. A deadlock is a situation in which two computer programs sharing the same resource are effectively preventing each other from accessing the resource, resulting in both programs ceasing to function. Program 1 requests resource A and receives it. Program 2 requests resource B and receives it. Program 1 requests resource B and is queued up, pending the release of B. Program 2 requests resource A and is queued up, pending the release of A. Now neither program can proceed until the other program releases a resource. The operating system cannot know what action to take. At this point the only alternative is to abort (stop) one of the programs. When you reach a deadlock, the PC appears to hang. With a userdump you can get the information to resolve this problem. WinDbg !locks command will examine process critical section list and display all locked critical sections, lock count and thread id of current critical section owner. The command kv. reveals the function callback stack for the thread that was active at the time of the trip. This stack is read from bottom to top: the topmost function is the last function to be called and the bottommost function is the first function to be called for this thread. Once you locate the thread, you see it has a call to the WaitForCriticalSection function, which means that not only does it have a lock, but it is also waiting for an object that is locked by something else. You can find out what is locking the object by looking at the first parameter of the WaitForCriticalSection call.